I was caught a bit flat-footed by this question, because the answer has been clear in our analytics for some time. Thankfully, the answer is very simple: The mobile use case is that more than half of our users are on mobile devices. Our company’s analytics shows 58% mobile traffic vs 42% desktop. Desktop traffic is declining and mobile is growing. You should examine your own statistics, but for the sake of this article, I’m going to speak broadly. StatCounter currently shows global mobile usage at 52% and climbing. According to a StatCounter press release, mobile and tablet internet usage exceeded desktop for the first time worldwide in October of 2016, but the pattern has been clear for years. These numbers do vary a bit regionally. Currently the US and UK show about 40% mobile usage. Africa has 60% mobile usage, and Asia is at 67%! 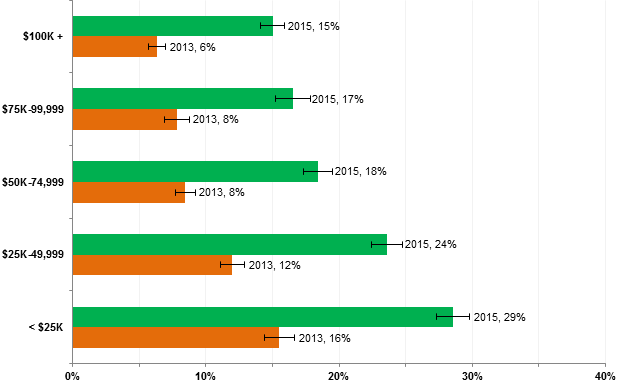 In all cases, the share of mobile usage is still climbing. Asia’s inflection point (where mobile overtook desktop) was in 2015, as was Africa’s. Projecting forward, we can guess that the inflection point in the US will likely happen in 2017. And that’s just analyzing overall traffic. It gets more dramatic when you consider the percentage of your audience who only accesses the internet via a mobile device. The number of mobile-only adult internet users was between at 15 and 20% in 2015, (depending on income) and that number is steadily increasing every year. The global trend is clear. Check your analytics. 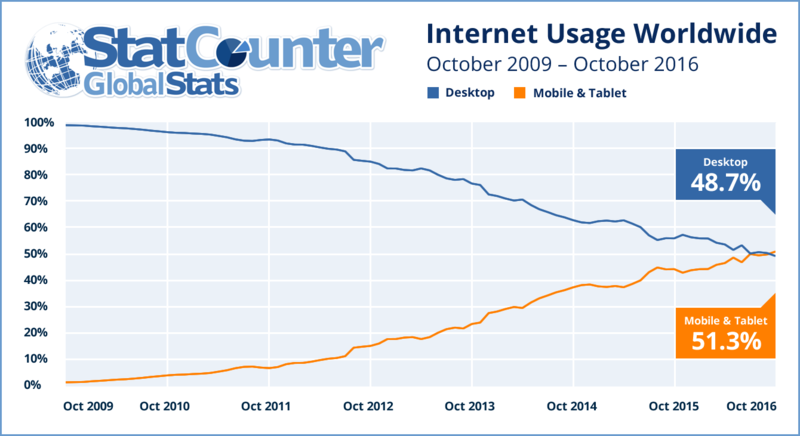 Even if your mobile users don’t currently outnumber your desktop users, they will soon. The mobile use case is that your users are on mobile devices.